Duke is set to play three games in Canada starting tomorrow evening. With Cam Reddish and Tre Jones sidelined due to injury, here is what to watch. 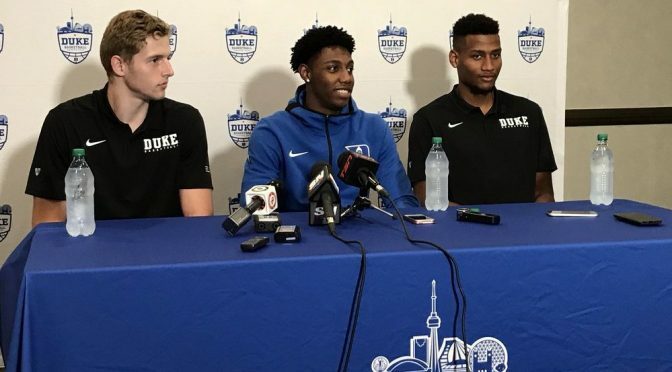 While the starters have yet to be announced, Mike Krzyzewski said in his press conference that the ball would run through R.J. Barrett on the Canadia trip. I asked Barrett last week if he was comfortable in that role and he said that he was. Duke loves to play what they call positionless basketball but they have a true PG this season in Tre Jones when healthy. 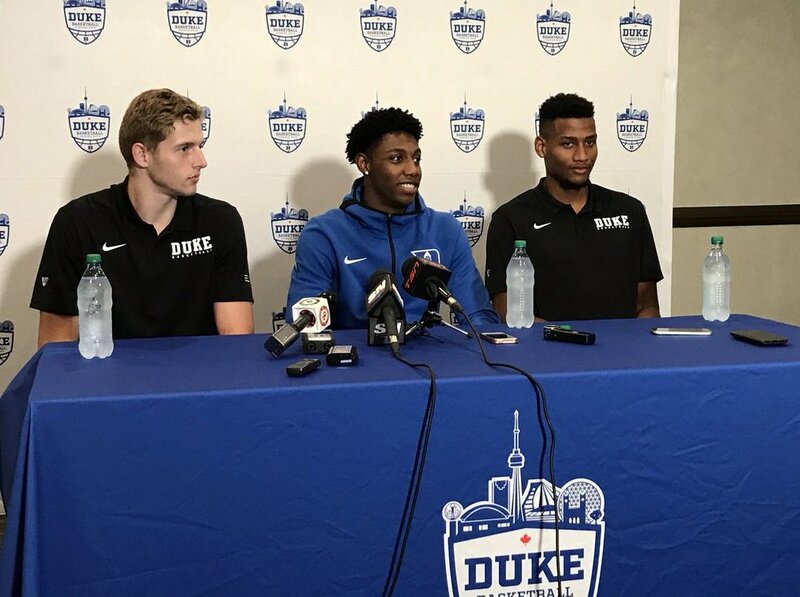 Duke will likely go with Marques Bolden, Javin DeLaurier, R.J. Barrett, Zion Williamson and Alex O'Connell. With the aforementioned injuries, Duke will play their bench and they'll do so often, BDN Premium members know who I projected as the season rotation, but Duke needs another body or two to become viable if there are injuries. Jack White will get some quality time and he could be the likely candidate for added depth once the season starts, Krzyzewski said he had lost ten pounds in the offseason, Another source close to the situation said their goal was to get the Austrailian product to play with more confidence. We can also expect to see Joey Baker, Antonio Vrankovic, Justin Robinson, and Jordan Goldwire see significant minutes. These guys are good and they're about to let the nation see that. Barrett is a confident player who enjoys challenges. He will thrive being the one who dictates action on a trip home. Zion Williamson literally makes Coach K smile when he speaks of him. All eyes will be on the South Carolina native and if his game translates to the college level right away. Duke will look to Javin DeLaurier and Marques Bolden to lead as both enter their junior seasons. Duke has also been getting some chatter from White and O'Connell while the talented newcomers adjust. The Duke staff is just scratching the surface on conditioning and they have yet to put in major parts of the system. Duke will play up-tempo this season with more man to man but this trip might not reveal how effective that can be. This will be the first time we have seen this staff together. Gone is Jeff Capel and entering is Chris Carrawell. It will be interesting to watch how things are handled with the aforementioned along with Nate James, Jon Scheyer, and Nolan Smith. While Smith is not technically a coach, he plays a major role. It is worth noting that every coach or staff member mentioned has a national championship ring while at Duke.